A sliver of land between Namibia, South Africa and Botswana became the Kalahari Gemsbok National Park in 1931. The position of park warden was held by the Le Riche family from the inception of the park (when their only transport was a donkey cart) until 1994, the job passing from brother to brother and father to son. The Botswana Gemsbok National Park was proclaimed in 1938 and the Mabuasehube Game Reserve was added in 1971 and incorporated into the Gemsbok National Park in 1992. In May 2000 the Kgalagadi Transfrontier Park was officially opened, merging the parks and allowing visitors to move freely across international boundaries within the park. The boreholes are an integral part of the Kgalagadi, attracting animals and providing precious water in the arid environment. To the south-east of the country where deep-red Kalahari dunes mark the landscape and farms with names like Vergenoeg (far enough) and Tranendal (dale of tears) line the dusty road, lies a bright pocket of Kalahari wilderness. I entered the Kgalagadi Transfrontier Park with trepidation. My small car was dwarfed by all manner of four-wheel drive vehicles. “Are you going to drive through the Kgalagadi in that?” I was asked at the camp shop, where I caught snippets of excited conversation about afternoon lion and cheetah sightings. It wasn’t the first time my small Chihuahua of a car was pretending to be a Rottweiler. The SANParks website made it quite clear that sedan vehicles experienced difficulty on the sandy roads. But, choosing to make do with what I had, I decided to brave the Kgalagadi roads en route to Namibia. Bordered by Namibia, South Africa and Botswana, the 37 256 km² Kgalagadi Transfrontier Park provides a safe haven in the arid environment for a plethora of wildlife. Water from boreholes in the dry Auob and Nossob riverbeds attracts antelopes, the big cats and everything in between. The area is characterised by vegetated red sand dunes and camelthorn trees adorned with sociable-weaver nests. It’s a medley of dramatic desert colours presenting an unexpected soft desert beauty in the dry Kalahari. Trying to answer last-minute emails, I was still in city time when darkness descended on Twee Rivieren Camp in the southern section of the park. But in the morning, as I drove out of camp, I was relieved to leave behind the black cloud of city trappings when cellphone reception disappeared. I waited for the throng of vehicles that leave camp at sunrise to get ahead and then ventured out at a snail’s pace. There was only one thing to do here – and that was to get into Kgalagadi rhythm. I could feel the quiet beat of the Kalahari wilderness settling my soul. Hours passed as I was absorbed into the land, noticing the small and large, avian and terrestrial. Every bend in the road revealed something of interest. An ostrich couple herded their chicks to safety, black-backed jackal pups standing on hind legs suckled thirstily, springbok gathered on swathes of valley greens, and gemsbok watched me warily from a sandy slope. Those verkykers (binoculars) – so aptly called in Afrikaans and directly translated as ‘far-lookers’ – proved indispensable. Vehicles parked on the side of the road alerted me to leopard and cheetah lying in the shade of trees – so easy to miss – and secretary birds stamping their feet in the sand searching for lunch, while vultures perched on treetops awaiting their next meal. Reduce the pressure of your tyres to 1.6 bars while in the park. Avoid the hottest time of the day by leaving at first light, resting at midday and venturing out again in the late afternoon. Remember your binoculars and bird guide. Mata Mata is often fully booked, so it is advisable to reserve accommodation beforehand. 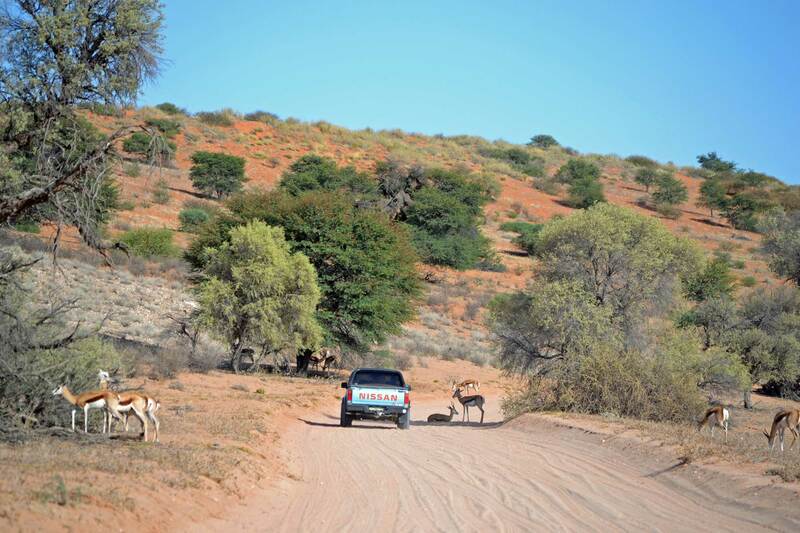 Some trails and access roads to wilderness camps are suitable only for 4×4 vehicles (booking essential). Bring your passport if you plan to exit the park into a different country. Note the gate times (sunrise to sunset), which change from month to month during the year. Bring a swimming costume in summer and your winter woollies in winter. Use sun protection and wear a hat to protect yourself from the Kalahari sun. Carry sufficient water for a day on the road (and an extra spare wheel and tow-rope if in a sedan vehicle, just in case). 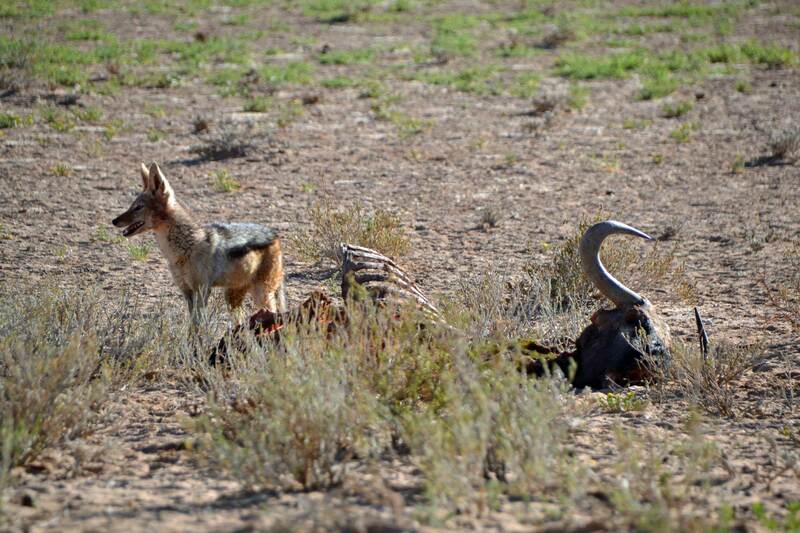 Kgalagadi is all about slowing down so that you don’t miss the animals that aren’t easily spotted. Even the 50-km/hour speed limit is often too fast. A good tip is to look in the shadows under the camelthorn trees. They are resting places favoured by cheetahs and lions sleeping off the night’s activity. 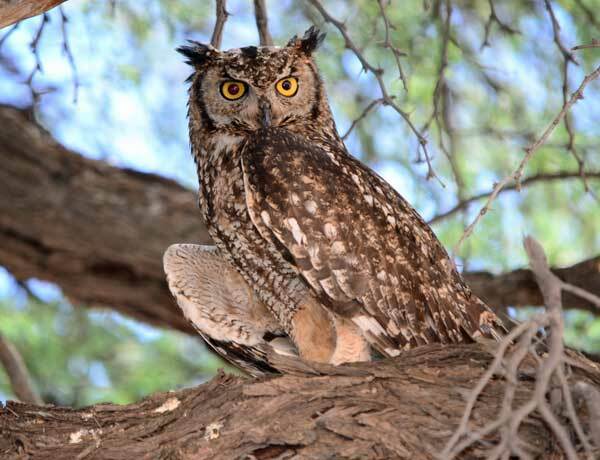 Also remember to look up into the trees for owls and owlets, perching in the branches. And don’t forget about the variety of small creatures that can absorb you for hours with their antics. I had lapsed into complacency, totally forgetting about my relatively smaller vehicle when suddenly the roads became sandier as I neared Mata Mata in the north-west. “Ah, no problem,” I thought, giving a bit more petrol for the sandier sections. It was only when I slowed to watch an ostrich that I felt my car battling to get a grip in the sand and just made it up a sandy incline, knuckles white on the steering wheel and giving it everything I could. A little bit of Rottweiler power and four-wheel-drive traction would definitely have been appreciated. It was with relief that I entered the camp and was quickly absorbed into the Kgalagadi way of doing things. It was siesta time; time to spend lazy midday hours under the shade of trees with a book or in quiet contemplation or conversation, with intermittent dips in the pool. Camp peace descended. It was late afternoon when the first vehicles started up with a throaty diesel roar. The temperature cooled and the sun dipped. It was that time of day when lions start to stretch and yawn and slowly get to their feet, and it couldn’t be ignored. This was the Kgalagadi at its best. The red dunes glowed as if burning with an inner fire and the green vegetation adopted a verdant sheen. Eventually, the sun dropped behind the dunes and long shadows extended over the land. And then, even though gold still lit up the land in parts, and glimpses could still be caught in side mirrors, it was time to head back to camp before the gates closed for the night. But the excitement wasn’t over yet, and four lions visited the camp waterhole to slake their thirst. 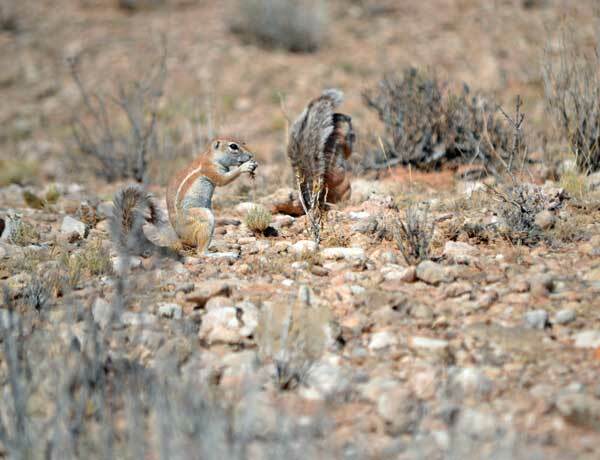 When they went off on their nightly jaunts, everyone returned to their campsites and suppers. It was early to bed to begin the next day at first light. It was easy – and so good – to fall into this Kgalagadi rhythm. A devilish wind picked up in the middle of the night and red Kalahari sand blew into my tent, coating me in fine desert powder. I awoke to a dust storm. Sand flew through the camp in gusts. I took refuge in the washing-up building to sip on hot coffee before battling with my tent. It had turned into a sail in the wind and wrestled with me until I managed to wrap my arms around it and haul it onto the backseat. Immigration stamped my passport and I blew out of Kgalagadi onto the gravel roads of Namibia. The wind gods blew and blew as I concentrated on avoiding patches of loose shale. Farm stalls and vibrant red Kalahari dunes caught my attention along the way. Windmills spun madly as if threatening to spin off their axles and fly away. I reached the tar at Stampriet in a final cloud of dust and noticed I had cellphone reception. I was back in civilisation. A fleeting feeling of nostalgia and loss washed over me as I re-entered everyday life. Kgalagadi dreaming had slipped away. The name Kgalagadi, ‘place of thirst’ stems from the San, who were the original occupants of the land. Kgalagadi’s waterholes have interesting names. Some, like Munro, were named by the Scotsman, Roger ‘Malkop’ Duke Jackson, who surveyed the area between 1913 and 1917, while others tell a definite story and were chosen by people who had memorable experiences in the area. The name Leeuwdril, for example, can be translated as ‘lion shiver’. A man named Matthys had a frightening encounter with a lion near this waterhole. He stood his ground while the lion eyed him. It eventually gave up on him and turned away, but left Matthys shivering in his boots. Marie se Gat was supposedly named after a determined wife who continued to drill the borehole when her drunken husband could not complete the job. !Xaus, the name of the lodge is the San name for ‘heart’. The meaning of the name is twofold: it stems from the heart-shaped indentations around the adjacent pan and also refers to the symbolic importance of the lodge to the Mier and Khomani San communities. Those wanting to exit/enter Namibia from the Mata Mata border post are required to spend two nights in the park. This is not too much of a hardship, as an overnight stay at Mata Mata in the north and Twee Rivieren in the south grants time for game viewing on the 120-km drive between camps. Visitors with more time on their hands (and this is the place to make that time available) can also explore the route to Nossob to the north-west, and further north. The three main camps have campsites and chalets, and are equipped with fuel stations, swimming pools and shops. Those wild at heart can also choose to stay at an unfenced wilderness camp – and there are stories of visitors feeling the warm body of a lion nestle next to them at night at the more rustic camps. The more adventurous (and better equipped) can travel onwards and explore the less-travelled routes into Botswana. Besides the three traditional rest camps, there are six unfenced wilderness camps and a luxury lodge. Guided game drives (early morning and late afternoon), a morning two- to three-hour guided walk, a guided Nossob 4×4 4-day Eco-trail and a 2-day !Xerry Wilderness Hiking Trail (April–October) are offered. See www.sanparks.co.za/parks/kgalagadi. 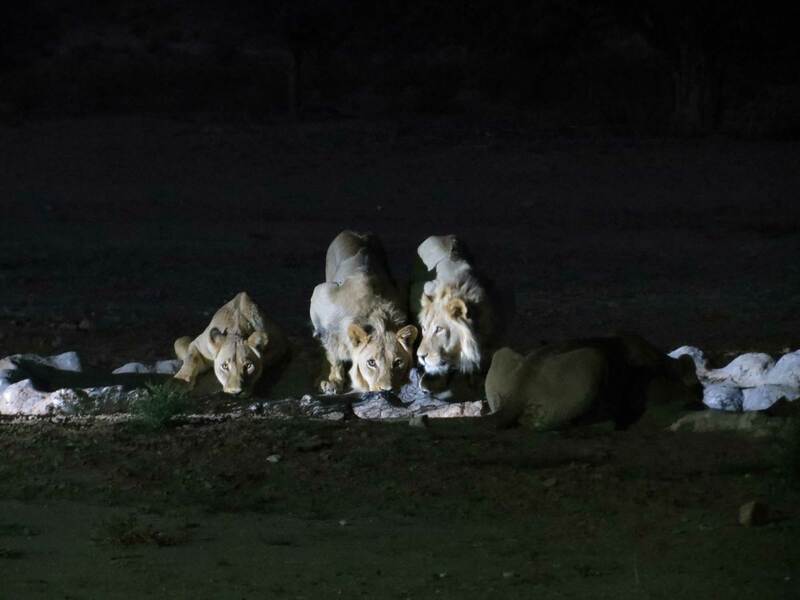 But the excitement wasn’t over yet, and four lions visited the camp waterhole to slake their thirst. 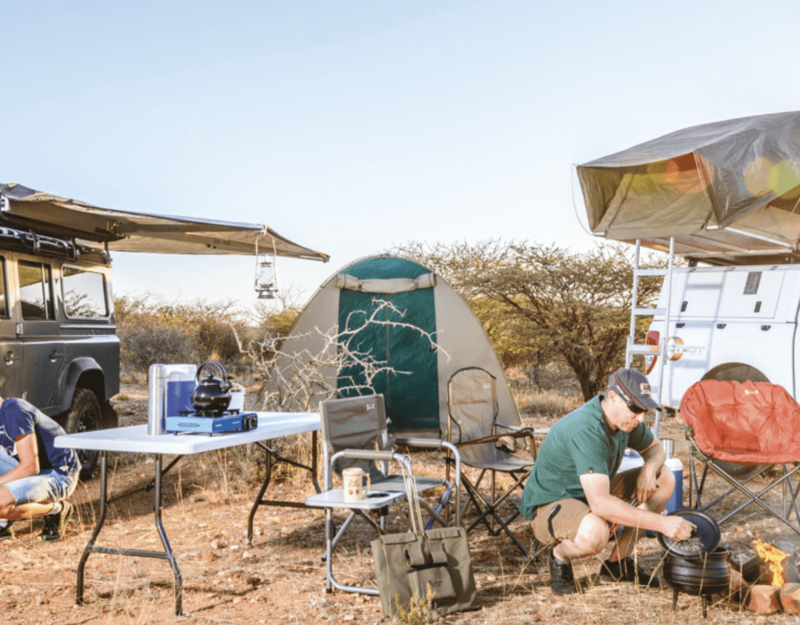 The Kalahari is known for its searing summer temperatures, rising well into the 40s (degrees Celsius) and for its icy winter temperatures, which can drop to as low as –10˚C. The Nossob and Auob Rivers, which run through the park, are ephemeral rivers that flow for only short periods after seasons of exceptional rainfall. Although they very rarely flow (a portion of the Auob flows approximately once every eleven years and the Nossob twice every hundred years), the rivers carry rainwater in the wet season and hold underground water. Kgalagadi provides an alternate route when travelling between South Africa and Namibia, with an opportunity for an exciting Kalahari experience in between. From Windhoek, veer off from the B1 before Mariental and continue on the C20 towards Stampriet. From here, follow the gravel C15 via Gochas for 250 km until the Mata Mata entrance. The C17 is the route to/from Keetmanshoop. Mata Mata also serves as the border post and is open from 8:00 to 16:30. Twee Rivieren in the south is the border post into South Africa, open from 7:30 to 16:00. From there, it’s a 265-km drive on the tarred R360 to Upington. At the beginning of the 20th century, the Nama rebelled against German colonial rule in German South West Africa. One by one, the Nama leaders surrendered or fell in battle. Simon Koper continued the struggle from the Kalahari, which was then part of British Bechuanaland. The Germans set up a station at Geinab (Groot Kolk today) and used a large camelthorn tree as a lookout post. Both sides suffered casualties after a battle at Seatsub Pan in 1908. Koper and his men later attacked the Geinab outpost, gaining the upper hand by using their superior knowledge of the desert environment. History didn’t stop there and at the outbreak of WWI, the South Africans drilled boreholes along the Auob River to provide water for the army should they need to invade the country from the Kalahari. Guards from the local community were employed to protect and maintain the boreholes. They were permitted to settle next to the boreholes with their livestock and families. The South Africans never made use of this route during the war, however, and the land was made available to farmers who tried to farm on the arid land. As it was difficult to make a livelihood in the desert, the farmers resorted to hunting, gradually denuding the area of game. This article was first published in the Autumn 2014 issue of Travel News Namibia.